Am I really like everyone else? I have talents and hobbies. I believe in certain things and don’t in others. I recognize when someone is being taken advantage of and/ or bullied. I know the right thing to do and try to follow the rules of the world. I try to help those less fortunate when I can. I am of average intelligence. I have graduated from high school and college. I have held several jobs. I have to take medications on a regular basis or could end up cycling into a manic or depressed phase. These medications sometimes have serious side effects sometimes resulting in hospitalizations for “medical” problems. I have to worry about people finding out that I have a mental illness because they might judge me. 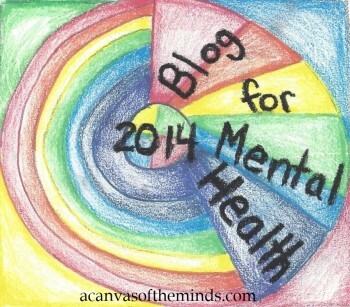 I have to fight the stigma attached to mental illness. Although cancer, diabetes, etc. are problems that society has accepted and people can talk about, usually talking about mental illness is taboo. I have a family who loves and supports me, however, many others afflicted with a mental illness are not as fortunate and often end up homeless. Society just does not accept me. They are uneducated about my illness, know there is help out there and know that I can function in today’s society. I fight the problem of being overweight due to my illness. I have to worry that in a manic phase I may do something I will regret later. If I am hospitalized for a psychiatric reason, I am often not treated with respect and dignity. I am lucky if my room is cleaned every 2 or 3 days. The staff is so overwhelmed that they do not have the time to give me the attention I need to get better. Oftentimes, the staff have treated me like an animal. Most police and other first responders are not trained on how to deal with me and my illness. Although I am very open and honest about my illness now, I had to try and hide it before in fear of losing my job and friends. Steps needed to be taken to raise awareness of an illness that affects 1 in 4 Americans. The stigma needs to be lifted so the mentally ill are not ostracized, discriminated against, and judged. The stigma needs to be erased so people in need of help, will go and get it. Everyone should know where they or a loved one can go when in crisis or at least know what phone number to call. Legislators need to listen and respect the thoughts of people with mental illnesses and their families in order to better the system. Advocates for the Mentally Ill need to come together and demand change. We, as people with mental illnesses, need to be treated like everyone else. This entry was posted in Uncategorized and tagged advocates, am i like everyone else, bipolar disorder, discrimination, legislators, mental illness, mentally ill, stigma. Bookmark the permalink. 5 Responses to Am I really like everyone else? There is such a continuum of degrees of severity in every dx. I have a friend w/schizophrenia who after intense treatment from an ACT team is working full-time & teaching classes for NAMI. Then a friend’s son w/schizophrenia became so religiously delusional his parents had to get guardianship & he was court ordered to receive medicine. Now he thinks his mother is Satan (medicine not working) for getting guardianship & the court ordered meds. He has threatened to kill her; smashed the locked door of her bedroom when he was raging at her & she tried to find safety there. She called 911 & after trying every option he was placed in the state mental hospital. This sudden break happened when he was a freshman in college. The media may portray all mentally ill people as violent, unstable, scary people who might do harmful things due to their illness (untreated & sometimes WITH treatment), but we advocates error by presenting the safety of ALL mentally ill. We must attest that some “cases” are treatment – resistant & are dangerous people (often to themselves as well). If we play Pollyanna the public will pull out case after case where a mentally ill person has done something tragic. My own mother had schizoaffective disorder & was extremely abusive & scary & tried to kill us children. We got away & she proceeded to kill herself. I have bipolar 1 & have had lots of struggles w/suicidal behaviors & extremely low self-esteem. But, hey, if your mother tells you over & over she wished you had died at birth–that will have a deep effect. DBT helps me immensely. But if I fell off the “safety” edge, I would want to be taken away by force. If I become that irrational then I am no longer a “No Stigma” case. I need to be stigmatized as dangerous until I’m not for the safety of society. Some people, unfortunately, don’t get as good results from their treatments as many do. We need to keep society safe. Rant over. Sorry. Have a mentally ill brother that is very violent & not safe. Sedona there are plenty of violent people who are not mentally ill in terms of delusions and hallucinations and a small percentage who are; violence is a human issue not specifically an illness based issue. Being mentally ill does not make you significantly more likely to be violent. Having a predisposition to violence for entirely separate reasons (including poor conflict resolution skills) does. There is not statistically much if any correlation specifically between schizophrenia / hallucinations and violent behavior. You are failing to advocate and conflating the two due to personal anecdotal bias and i do not mind informing you of that. Sorry if my personal experience led others to jump to the conclusion you have. Thanks for correcting me. I certainly don’t want my experiences to be thought the same as everyone’s, of course! I completely agree- I’m trapped in the shame stage whilst also feeling guilty for having any negative feels as people just don’t understand them. Being talked down to, patronised, etc. I was only diagnosed 6mths ago, my life as a string, dependable single mum was taken away in a heartbeat! Lost my job, my friends, lost me 🙁. Like being told to get up and run when they’ve just taken your legs. Trying to run in wet sand. Being told by those closest to you that EVERYTHING you’ve done for, however long it was to become aware that something deep down is not right, is wrong. That every idea, thought, action was conducted when you were not in your right mind, completely undermining your own trust in yourself as you thought you were ok! Now read this encyclopaedia from cover to cover without opening it. The fear, the completely paralysing all consuming, pit of the stomach fear, that you cannot even trust yourself. You have no-one. Even you now cannot be you. This shame is disabling. You cannot manage every day life. You always could, juggling responsibilities, working all the hours you can to be as successful as you can at work but making that secondary to your family, your pathetic and weak. Your suddenly the type of person you despise yourself becoming. Your drive has gone. Your passion has gone. Your will power, your focus, your determination, gone, replaced by this consuming emptiness. Food is a tasteless hassle, your ability to form coherent sentences, be they written or spoken, gone. Your a pathetic grown up whose reverted to being a vulnerable, scared, tormented child. You are lost in side you. Everything that made you attractive to your social circle has left you, or at least under that thick, suffocating blanket you believe to be true. You don’t look Ill. Your just lazy (not physically unable to work) Your an attention seeker (when one of your core fears has become the shame from society who, just by looking at you, knows your just a weak and pathetic drain on them all, because you cannot cope with life) Grow up! Everything you had previous placed faith and hope has gone. Your dreams, those goals you had looked forward to achieving, at work, at home, in love, is physically ripped from you. Then the tsunami of question floods your consciousness. Am I good at my job? Have I messed up at work and not even been aware? What am I working for? What do my colleagues really think of me? Would they miss me? Do I care? Am I really liked or are they just wanting me to get what they want? Can they see how hollow I’ve become? Can they tell that I don’t care? Do they really love me? Are our plans real? Why would they come true? Am I just being blind to the reality that I’m just being used for their pleasure? Does anyone actually like me? Am I loved? … The endless mental battle, a battle you believe is visible to anyone you come into contact with so embarrassment and fear once again takes hold and you retreat inside yourself, physically inside your home. Your isolated. The guilt and the shame making it impossible to ask for help. You managed fine, people loved and admired your strength before so asking anyone to help you find the right path out of the fog would simply take away their respect for you. You try to act normal. Your life becomes an established cycle of ‘living normally’. It is not a routine, it is more complicated. You have, you believe, created the perfect ‘you’ and your goal is to act that out to those you still allow to be part of your life. People fear what they cannot see, so if they cannot see your mentally ill people will be around you. Well anyone left that is, you’ve rejected all relationships, pushed away friends and colleagues, even family so as not to bring them the shame burden that is clingy into every cell in your body. They want to help, but only the weak and feeble ask or take help right?…. And so it begins. You need to get up, washed and dressed to look normal but what a conflict that becomes. You don’t see the point of getting out of bed, washing, why? You let your skin start to suffocate too, why not? You can barely catch your own breath why let that get drained by your own body. Dressed? Suppose just in case that imaginary person knocks on your door to take you away…. But it is always the same clothes….you don’t care anymore, they’re just clothes that’s all. Food, meh. Nothing tastes as it did, your diet now consists of cardboard, now even your taste buds betray you. You can barely think, speak or write logically. Words don’t make sense, even spelling simple words is now impossible, verbalising them just makes you sound drunk, slurring your words or for the hilarity of others, you’ve managed somehow to find the right words in you head but they come out jumbled up, you’ve rearranged even the simplest of sentences or used completely the wrong word. Those little sniggers, the immediate correction by someone, the ‘what did you say?’ the ‘Say that again’ or just the laughing at you for being now in comprehensive makes that fear so much more. So hide. Your afraid to make decisions. You thought you’d always made sensible and well throughout decisions before, but having been told you had not makes you question if you ever can. What if you get it wrong? What if you agree to something expensive, something life changing, what if your choice is just the wrong one. Your now also afraid of the mail. What if I’m sent an official form? What if I get it wrong? I could go to prison for fraud! What if you reply to an email or iMessage the wrong thing? You now avoid all forms of communication. But you cannot not do something to still appear ‘normal’,after all they are all watching and scrutinising you. So you channel this fear into something. Spending too much money on stuff, because having stuff makes you appear normal right? Your home, whilst your cage against the world, becomes a manifestation of you. If it’s dirty you could lose it, people will have evidence your not managing. It needs to be spotless all of the time. So not to be judged, Ironic when at times personal care is ignored but prison must not be. Your paranoia sent into hyperdrive when someone visits you because they had an anonymous tip that your not coping! Now you were right all along, people are watching you!!!! Gosh, I can relate to so much of the reasons for not feeling normal! It is a very helpful and interesting blog, thank you!